Distribution: Vernal pool fairy shrimp are found from Tehama County south through the Central Valley and in isolated locations in Riverside County, the Coast Ranges, and the Agate Desert in southern Oregon. While widespread, the species generally does not occur in high numbers. Records for vernal pool fairy shrimp in the California Natural Diversity Database are concentrated in the Sacramento Valley and the San Joaquin Valley north of Fresno. Although vernal pool fairy shrimp have not been documented in the Natomas Basin, they have been found east of the Natomas Basin and north of Del Paso Road. Habitat Requirements: Vernal pool fairy shrimp are found in grassland vernal pools or similar seasonal wetlands. They require cool water with low alkalinity and low total dissolved solids and tend to be found in smaller pools about six inches (fifteen centimeters) deep that stay flooded for relatively short amounts of time. 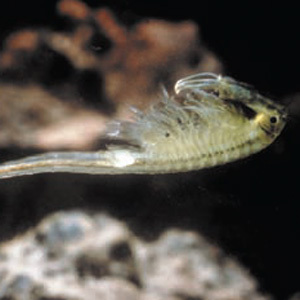 In the southern extent of their range, vernal pool fairy shrimp are found in larger, deeper pools, probably because of the cooler water temperature of these larger pools. Reproduction and Demography: The vernal pool fairy shrimp reproduces in ephemeral pools flooded by winter and spring rains. Adults cannot survive the drying of these pools in the summer. However, the eggs laid by the female are surrounded by a shell that protects the embryo from the arid environment; these cysts allow the embryo to remain in a dormant phase””also called diapause””for years if necessary. The vernal pool fairy shrimp will not hatch unless water temperatures are below 50 degrees Fahrenheit, which can occur with cold winter rainstorms. With the onset of suitable temperatures and flooding, some eggs in the vernal pool soils will hatch. Once hatched, the young shrimp go through three stages before reaching adulthood. The rate at which they mature depends on water temperature and can vary from 18 days to more than 120. Movement: Vernal pool fairy shrimp can colonize new pools when relocated by flood waters or when cysts become attached to the feet of birds or other animals. Cysts can also pass unharmed through the digestive tracts of other animals, providing another potential mechanism for dispersal between pools. Ecological Relationships: The vernal pool fairy shrimp diet consists of unicellular organisms such as algae and bacteria. Vernal pool fairy shrimp are a vital source of nutrients for a range of wetland species, including waterfowl, shorebirds, and amphibians. They are also consumed by vernal pool tadpole shrimp.